What is the best way to show a user that a social media account is linked? I am working on a profile page where user can link their social media account (Twitter, Facebook. etc.) But what is the best way to show a user that his account is linked? Like a checkmark or something else? I'd suggest to remove the Connect button like above and change it to an unlink button. Show them the linked account id and provide an Unlink button next to it. In case you don't have an unlink option (which would be a bad idea), just don't show the linked option at all. Not the answer you're looking for? Browse other questions tagged website-design buttons social-media or ask your own question. Social Media Icons - show all visible, or group under “share”? How to show users the status of their sharing between my app and their social networks? Visualize deceased user on social media? Best way to capture users facebook & twitter usernames? 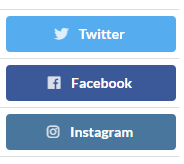 Best practice for ordering social media login buttons?